A Daily Dose of Architecture Books: Goodbye Folk Art, Hello "Art Bay"
Goodbye Folk Art, Hello "Art Bay"
In an unfortunate but not surprising move, MoMA's architects for their latest expansion, Diller Scofidio + Renfro, have announced that they just couldn't save the 2001 Folk Art Museum designed by Tod Williams and Billie Tsien. Liz Diller said, "after intensive study it became clear that the building could not be adapted without compromising its integrity." 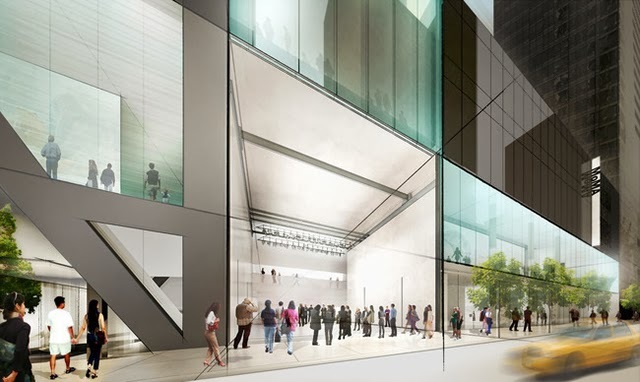 The site of the Folk Art Museum will become a large space at street level – an "Art Bay" that serves as a multi-use space – with a "Gray Box" theater/gallery above. 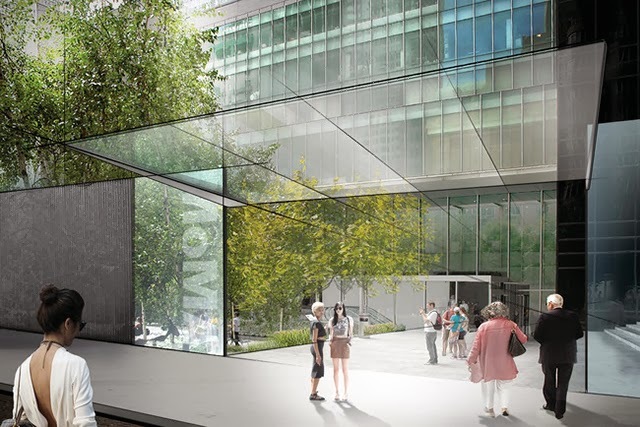 As seen in the rendering above, this space appears to make MoMA more inviting on West 53rd Street, but such is indicative of a plan that tries to extend but also improve the 2004 building of Yoshio Taniguchi rather than make any concessions to the little gem that stood in its way. 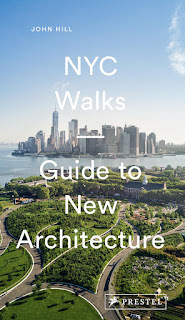 The new entrance to the sculpture garden on West 54th Street is commendable, but it should be seen as part of the larger plan (below) that places the emphasis on circulation over anything else. 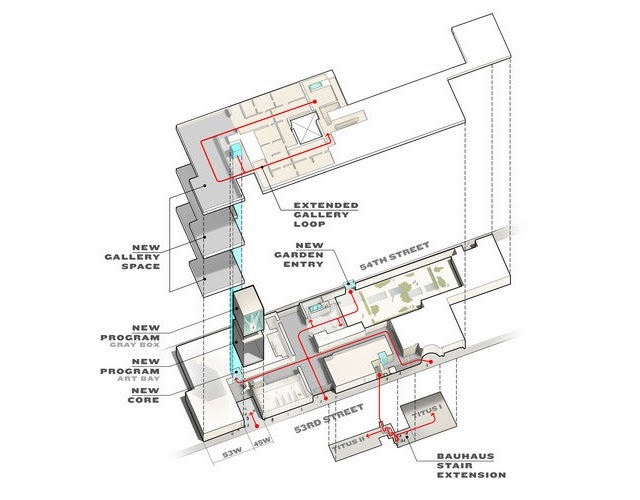 It seems like MoMA has been trying to overcome the poor circulation that has accompanied its growth, beginning with Cesar Pelli's escalator atrium and continuing with Taniguchi's circuitous route from the entrance to the galleries above. Given the two spaces – Art Bay and Gray Box – that will take over the galleries of the Folk Art Museum, the result of the DS+R design comes down to scale and flexibility. 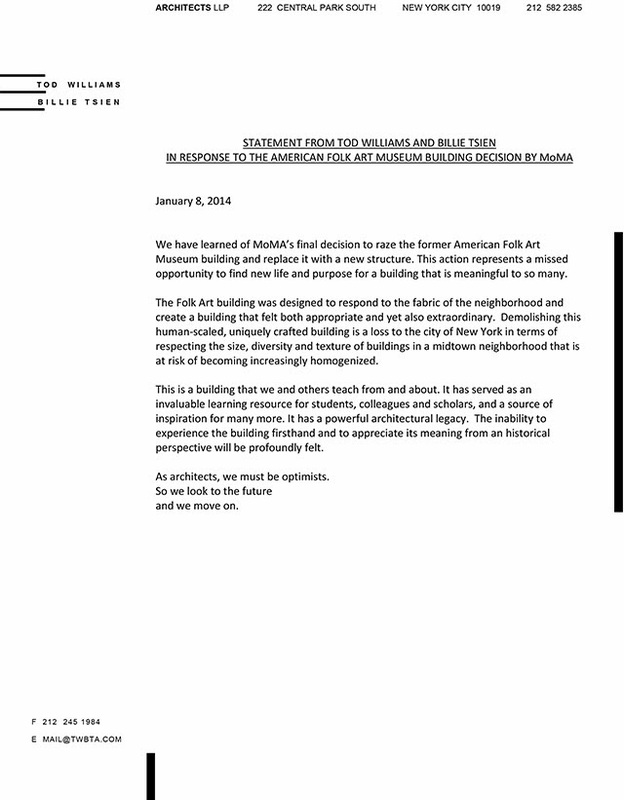 Ultimately the Williams Tsien design was too small and inflexible (like I said, not a surprising move) to work for MoMA, regardless of Diller's specious words about integrity. As sustainability and the need to preserve buildings increases, so does the need to be creative about how buildings are reused. In this case the creativity is nowhere to be seen.